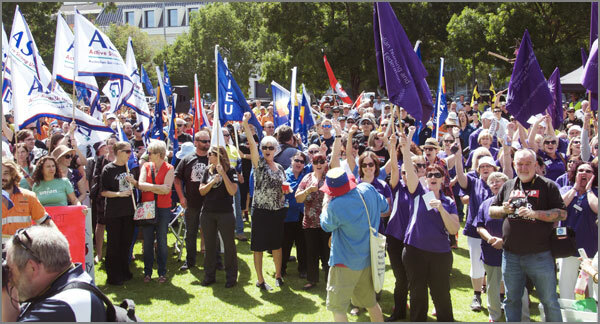 On Wednesday March 4, around 2,000 workers rallied at Parliament House in Perth to protest against the Abbott government’s Productivity Commission enquiry into the minimum wage, penalty rates, workplace conditions and union right of entry – the latter which has already been significantly restricted. The colourful flags of most of Western Australia’s trade unions were represented at the rally to show their solidarity and unity on fighting this issue which is pivotal to the strength and future of the organised working class. Unions WA secretary Meredith Hammat opened the rally outlining the underlying agenda of the enquiry by the Productivity Commission. “You can forget about penalty rates, forget about unions…as the Abbott government goes about creating a polarised society divided into the haves and the increasingly have nots. “They are going after pensioners and other retirees, young people who will have average weekly take home incomes reduced from the abolition of penalty rates and students who will be paying up to $100,000 for a degree,” added Hammat to illustrate how this government was using the Productivity Commission to take down the edifice of a decent, caring society. 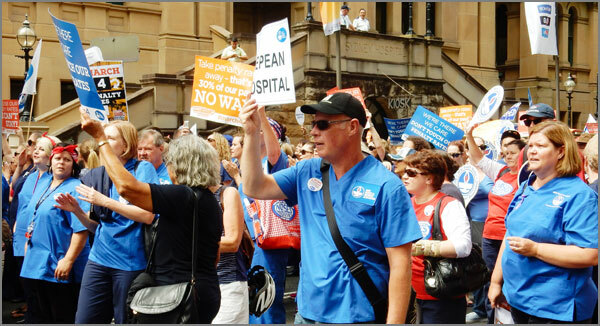 The attacks on Medicare will continue as part of an ongoing push of health services into the private sector where working class people would have to dip into their pockets every time they needed to see a doctor, said Hammat. Hammat also added that although an election was still some way off for WA Liberal Premier Colin Barnett, his government has a similar agenda to the federal Liberal government of making cuts to the public service and attacks on trade unions. Jake Whinney from the National Union of Students spoke of how the increased cost of education and other public services will bring about an intergenerational theft creating disadvantage for future generations – which will have less income as more money will be owed to the government by the workers. Brendan, who spoke on behalf of the 76 CFMEU members who are facing the Federal Court in Perth over taking industrial action, said that the action against them was a charade, adding that a worker has a right to say NO! to an employer’s cuts to safety and penalty rates. CFMEU state secretary Mick Buchan added that the 76 were going to court on March 23, and their fellow unionists would be outside the court to offer them support. Helen Tuck a former Tax Office worker and CPSU/PSU member recently made redundant after 30 years of service spoke of how the cuts to the public service reduced services to the public and increased work for those who are left with no increase in pay. Carolyn Smith state secretary of United Voice concluded the rally by urging workers to sign up for the beginning of a campaign to fight back against the Abbott government’s “vision”.